James M. Nabrit, Jr. was a graduate of Morehouse College and Northwestern University Law School. He joined Howard University’s law faculty in 1936 and, two years later, taught the first formal civil rights law course at an American law school. In the 1940s and in the early 1950s, Nabrit handled a number of civil rights cases for the NAACP Legal Defense and Education Fund, working with Charles Hamilton Houston, Thurgood​ Marshall, and others. He was one of the lead counsel on the Washington, D.C. case of Bolling v. Sharpe, a companion case to Brown v. Board of Education, but which was decided under the Due Process Clause of the 5th Amendment instead of the 14 th Amendment Equal Protection Clause. 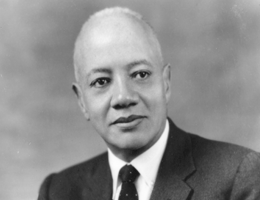 Nabrit was dean of Howard University School of Law from 1958 to 1960. He was Howard University’s second Black president, serving in the post from 1960 to 1965, and again from 1968 to 1969. In 1966, he represented the United States as a deputy ambassador to the United Nations. Nabrit was considered one of the leading constitutional and civil rights lawyers of his generation. James M. Nabrit, Jr. died in Washington, D.C. in 1997. He was married and had one son, James M. Nabrit III, also a lawyer.